In our previous blogs, we have discussed how to purchase furniture and how to decorate your home interiors in considerable detail. You have provided you precise tips as well as comprehensive guides regarding effective furniture purchasing and arranging techniques. Today however, we’ll be taking it a step ahead, talking about ways to maintain them. Whether its leather furniture or fabric, it will eventually start to wear out. Particularly the sofas of the living room set tend to lose their aesthetic value at a faster rate as compared to other pieces of furniture at home. In order to keep their appearance newer and sparkling, they need to be cleaned and maintained promptly. 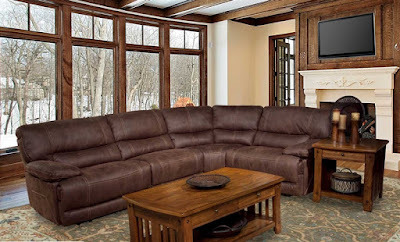 In this article, we are going to discuss 5 simple steps to clean the leather recliners and sectionals of your living room set. Read on to discover the easy techniques that can make your old furniture appear new. Thorough dusting is the first step of the cleaning process. Using a vacuum clean or otherwise, remove all types of dirt from your couch and wipe away the surface with a clean cloth. Don’t overlook the narrow spaces between the seats, where debris usually gets trapped. However, cleaning doesn’t mean to leave marks and scratches on your expensive sofa. Be gentle and careful to avoid causing any damage to the furniture. If living room is the place where you usually have your family dinner, there must be food strains on your sofas. These are mild stains that can easily be removed with a damp cloth, dipped in a soapy solution. Rub the cloth over the marks and then using a dry cloth remove the soap. For the areas covered with stubborn and greasy stains, use a high-grade leather cleaner that cleans such marks without affecting the texture of the leather. It is preferable to use wax cleaners rather than oil-based ones- they may adversely affect the ‘breathing’ of the leather. Whenever using a chemical on a leather recliner or sectional, always use a damp cloth to apply it onto the furniture. Dip the damped cloth in the chemical, and clean a small, not-very-visible section of the sofa to ensure that the product is causing no harm. If it doesn’t, proceed to gently clean the entire seat. Once the seat has been cleaned and dried completely, it’s time to apply some preservative to save it from future stains. Again, it is recommended to use a wax based conditioner that guarantees better results as compared to other products. Apply it gently all over the sofa and buff it with a clean cloth. There you go! Your shiny leather sofa is sparkling again. If you want to know more of such techniques or want to buy fresh pieces of recliners and sectionals, visit Home Cinema Center.